England & Co has lent works Eduardo Kac and Roy Ascott to the exhibition Electronic Superhighway (2016-1966) at the Whitechapel Gallery, London, in which key moments in the history of art and the internet emerge as the exhibition travels back in time. 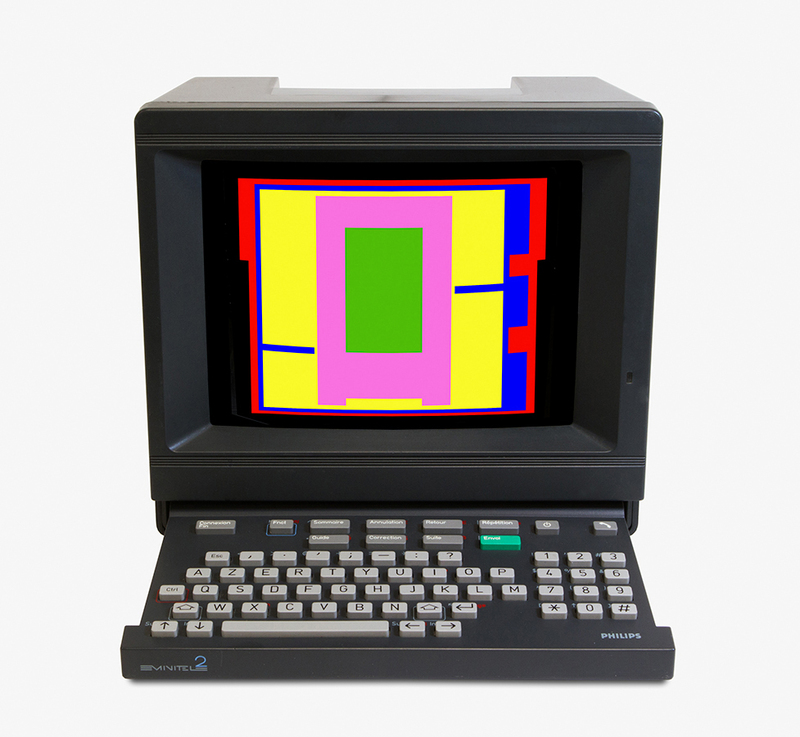 Eduardo Kac’s two Minitel animated poems in the exhibition date from 1985 and ’86. Kac was a pioneer of telecommunications art in the 1980s and he continues to investigate the philosophical and political dimensions of communication processes, bringing together the biological and the digital. He has recently been the subject of a paper in Art in America, entitled ‘Transgressive Bodies’ by Zanna Gilbert. Also on loan to Electronic Highway is Change Painting by Roy Ascott from 1968. Ascott is an influential British artist and teacher who has been a practitioner of interactive computer art, electronic art, cybernetic art and telematic art since the Sixties. England & Co is sad to announce the death of Maliheh Afnan, the distinguished Middle-Eastern artist who in recent years has been based in London. Born in Palestine in 1935 of Persian parents, educated in Beirut and Washington, her work addressed contemporary themes of displacement and exile. We are proud to have worked with her on two solo exhibitions at the gallery, several group shows and to have sold a major work to the British Museum. John Dugger’s maquette for his Chile Vencera banner – first hung in Trafalgar Square, London, in 1974 – is on show in the exhibition Agitprop! at the Elizabeth A. Sackler gallery of the Brooklyn Museum, New York (until 7 August 2016). Works by Cecilia Vicuña are also included in the exhibition. Dugger and Vicuña were both co-founders (with David Medalla and Guy Brett) of Artists for Democracy, an artists’ organisation formed in London in solidarity with Chile. 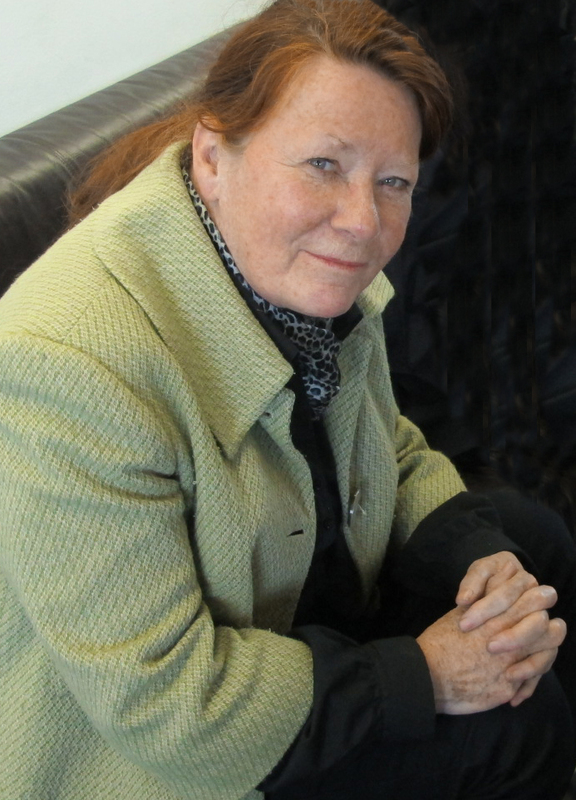 Tina Keane is one of the recipients of this year’s prestigious Paul Hamlyn Foundation Awards for Artists. Launched in 1994, they are the largest individual awards made to visual artists and composers in the UK. There are no strings attached – the intention of the Foundation is to give exceptional artists the time and space to create the best possible work. Gallerist Jane England will be talking about about the legendary German émigré, bohemian artist, author and art dealer, Jack Bilbo, and the gallery that he opened in London during the Blitz. 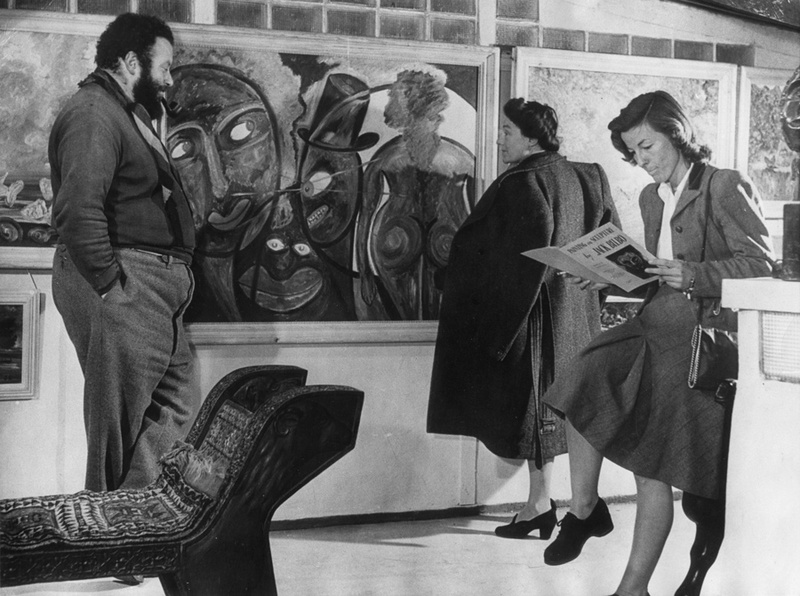 The Modern Art Gallery (1941-48) became a cultural hub in war-time London for British and émigré artists. This talk will take place in Room 5 of the exhibition Out of Chaos: Ben Uri, 100 Years in London, in the Inigo Rooms, Somerset House East Wing, London WC2, at 1pm. In No Quipu, No Book, Cecilia Vicuña expands on the concept of the quipu – the Andean writing system with knots – and the book. The exhibition at the Woodland Pattern Book Center in Milwaukee, USA, will consist of works created since 2001, along with archival documentation of book works dating from the 1970s. England & Co’s stand included works by Geneviève Seillé and Scottie Wilson. 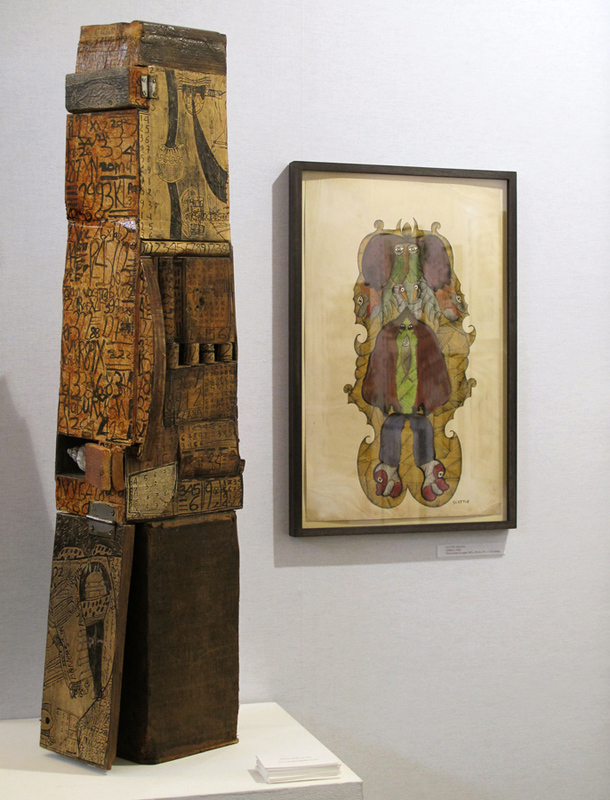 England & Co is taking part in the Outsider Art Fair, Paris, to be held in the elegant setting of the Hôtel du Duc, once owned by the Duc de Morny, half-brother of Napoleon III. Location: 22 Rue de la Michodière, 75002 Paris. 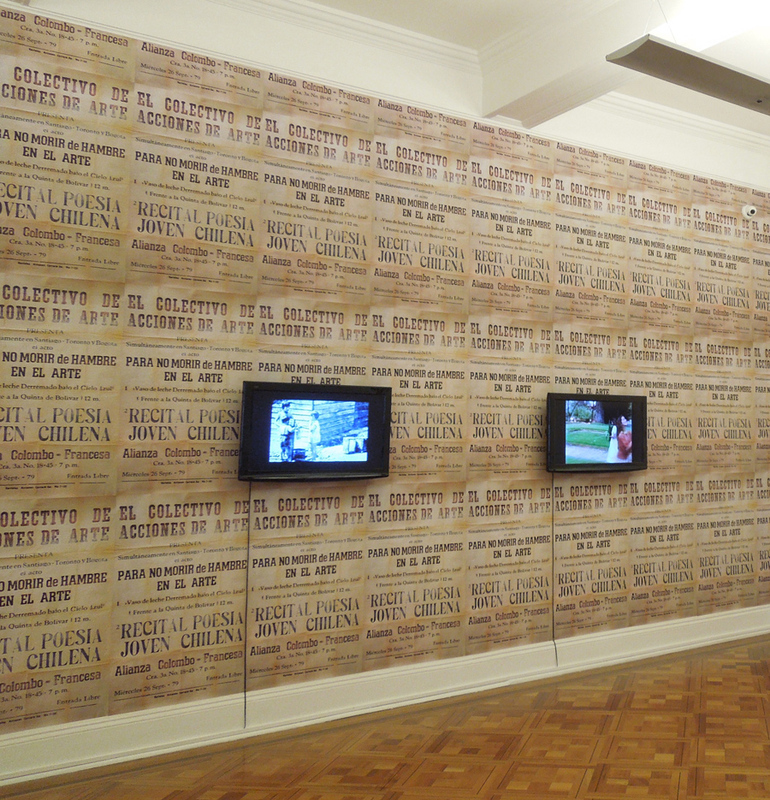 Cecilia Vicuña: video works installed at the Museo de la Solidaridad Salvador Allende in Santiago. Cecilia Vicuña is one of the artists featured in Ausencia Encarnada: Efimeralidad y colectividad en el arte chileno de los años setenta (Embodied Absence: Ephemerality and collectivity in Chilean art from the Seventies). The exhibition focuses on works made by Chilean artists at home and abroad in response to the political upheaval of the 1970s. It will run until 24 January 2016 at the Museo de la Solidaridad Salvador Allende (MSSA), Santiago Centro, Chile, where it is presented in collaboration with the David Rockefeller Center for Latin American Studies (DRCLAS) at Harvard University. Cecilia Vicuña has installed a new iteration of The Origin of Weaving – a poem in space that traces the symbolic invention of the first cross thread from which all weaving is derived – at the Poetry Foundation, Chicago. It is part of the exhibition Dianna Frid and Cecilia Vicuña: A Textile Exhibition that investigates the intersection of weaving, textiles and language. On 17 September, Vicuña will present a site-specific performance as part of the exhibition. Photographs by gallery director Jane England feature in the exhibition curated by Bruce Haines and artist Jan Pleitner that opens tonight at Adler, Adlerstrasse 6 (Hinterhof), Düsseldorf. Other artists include Alan Kane, Ali Altin, Katharina Busch, Magdalena Kita and Alex Wissel.